Graff orchestrates a fascinating encounter between Haute Horlogerie and Haute Joaillerie with its new creation: the Diamond MasterGraff Grand Date Dual Time Tourbillon. The result of more than 2,000 hours of development, its mechanical movement associates a flying tourbillon with a dual-time display and a large instantaneous date that jumps at exactly midnight. While the exclusive calibre reveals the beauty of its gear wheels through the sapphire crystal, the case and dial exalt the jewellery-making expertise of the House through a dazzling setting of 329 diamonds totalling 13.7 carats. 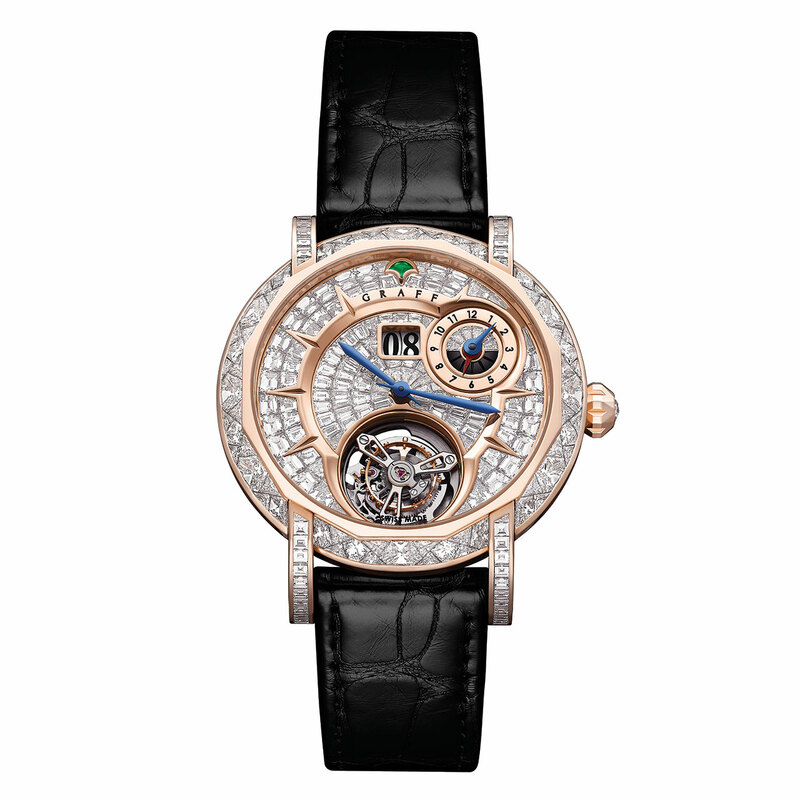 Set against a backdrop of rose or white gold, the precious stones exercise their timeless powers of fascination and sparkle with radiant fire on a dial also lit up by an emerald at noon, as well as forming the emblematic Graff signature on the dial: an invisibly-set mosaic crafted using an exclusive technique resulting from a full year’s research.